My whole life I have wondered how people become radicalized. What prompts someone to follow what started as logical beliefs to a dangerous extreme? It has always seemed so irrational to me. Now, I think I get it. The current political climate is testing me, radicalizing me, despite my best efforts to the contrary. There is a lot of talk about bias bubbles and alternative facts. People ‘throw shade’ all day long. And I get it. No matter what you believe, right now, you probably feel attacked. I can feel it happening to me. There is this constant tension. If I pay too much attention, I will lose my mind. My heart hurts every day. But if I don’t pay attention, if I am willfully ignorant, I am complicit. I freely admit that, politically, I lean quite far to the left. The last two years, I have felt the urge to lean much further. My inclination to action keeps increasing. In the last year, teachers have gone on strikes all over the country. People have organized and participated in protests and marches. Whenever possible, in whatever way possible, I have chosen to participate more than ever before. At first, it felt like a natural extension of my existing beliefs. It wasn’t until I starting talking to people while traveling around the country that I realized I was falling victim to an unexpected degree of radicalization. To address my concerns about my own potential extremism, I took some conscious steps. I diversified my news sources after researching the organizations that tend to fall toward the middle of the political spectrum. Snopes and Politifact are now on my daily menu. I started reaching out to people with views different from my own and made a genuine attempt to hear diverse perspectives. I read every Tweet the president authors (honestly, I can’t bring myself to follow him). Though difficult, I make a conscious effort not to rush judgment on those whose beliefs are different from my own. My hope has been that I could rediscover my center. Instead, the opposite continues to happen. My grasp on reasonableness is constantly tested. The recent photo of two men wearing shirts stating “I’d rather be Russian than Democrat” is a perfect example. What reasonable response could this possibly evoke? How can I respond to this without falling into my own extremism or making excuses for the expressed sentiment? Where, in between condemnation and false equivalency, does sanity live? I have no answers. My emotional response cannot be completely denied. Perhaps this realization is the closest I can come to understand how people become radicalized to one extreme or another. I am being radicalized. There is no choice that doesn’t feel radical. To the left, to the right, to the middle, to intentional ignorance, extremism is virtually unavoidable. We are all being radicalized. If we can avoid also falling into irrational hatred and harsh judgment, maybe being radicalized is something I can live within myself. Maybe I am crystallizing my beliefs and taking action I was too complacent to take before. The current climate seems to be surfacing beliefs underlying our status quo that I can’t condone. I have always believed the status quo and many of our institutions perpetuated injustices. The degree to which so many of my neighbors, friends, colleagues, and countrymen support those injustices and the beliefs that underlie them has been both shocking and disheartening. The degree to which so many others in my world condemn those injustices and are willing to fight them has been equally shocking and uplifting. To me, being radicalized in our current political and social climate means paying attention. It means taking action for others. It means reflecting on and recognizing my privilege, my biases, and tempering my reactions with thoughtfulness and intention. 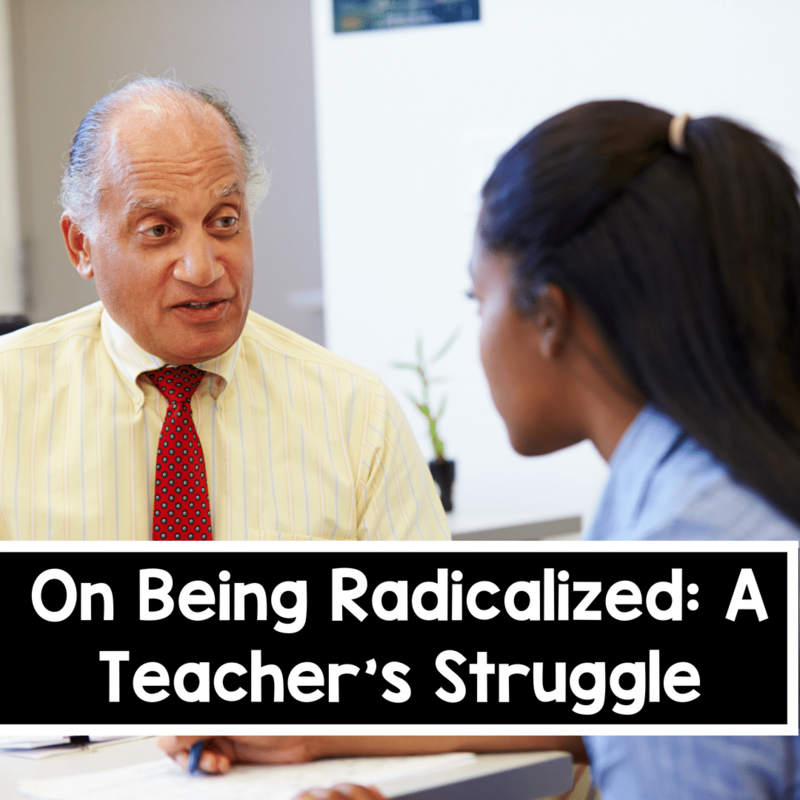 Being radicalized feels unavoidable. My goal now is to be more conscious of how I am being radicalized and temper my responses to others with as much compassion, empathy, and reason as I can muster. I get it now. Being radicalized is irrational. It is also a response to irrationality.